Half marathon #20 and race #56. This is the third time I've participated in this race. The first was on a relay team and the second was the full marathon. 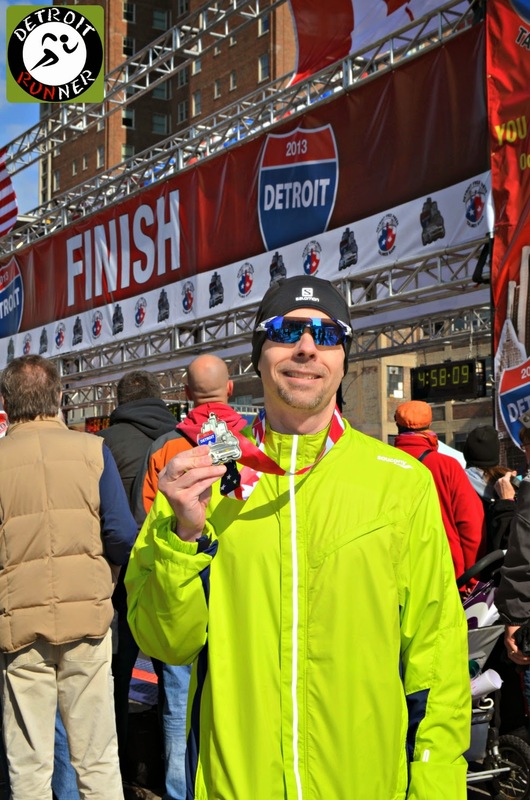 This was my first half marathon at Detroit. Overall, the race is always very well organized, incredible communication, a huge expo, a rare course over to Canada and back and usually the perfect time of year for a race. 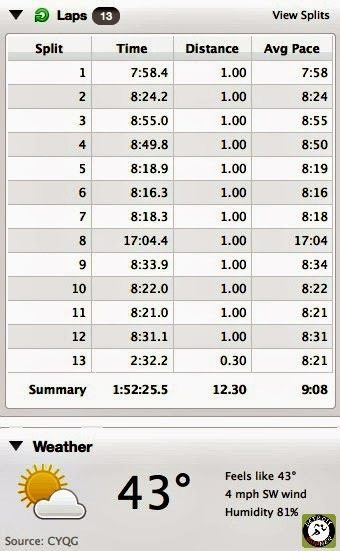 I had a great time at this one and used this as a training run instead of doing the 12 miles I had on my schedule. Registration was very easy. As with most races, you did everything online from their website(HERE). I registered back in January because they offer the best price for a few days when it opens. In fact, their website already shows registration opening 1/1/14. 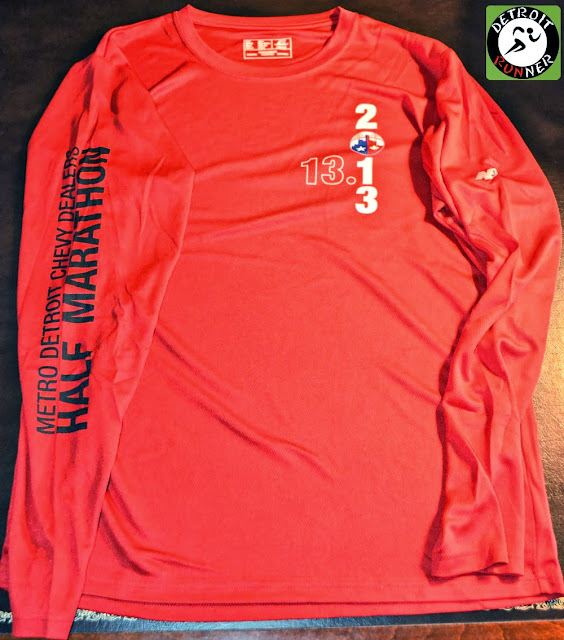 I paid $50 - one of the best deals for a half marathon of this size and for what you get. The race has an extremely comprehensive website with all information you would need about the race or to volunteer. The race also allowed transfers up to a certain time period. I believe that ended near the end of August when registration closes. It sounds like it closes too far away from race day but the race needs time to clear all the runners for Customs since you are leaving the country. While the race warns that you need to have your passport with you(which I did carry), I've never seen anyone get stopped(in the three times I raced Detroit) as long as they had their race bib clearly shown when going in and out of the USA. By the way, the race bibs were huge this year - about two inches wider and one inch taller than typical bibs. This year you could also not bring the backpack style of water over the border. 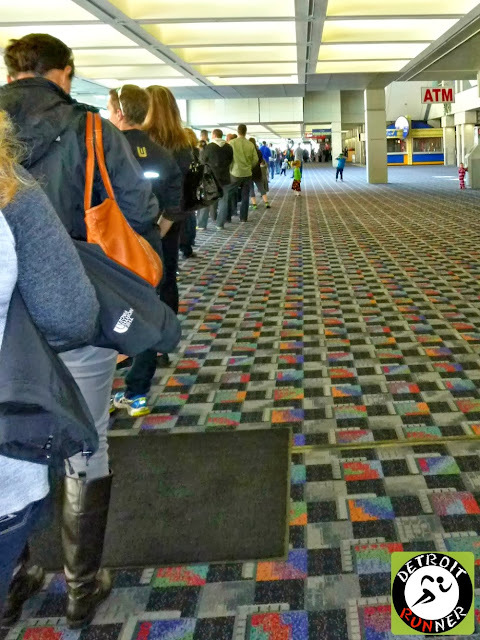 I went to packet pickup at Cobo Center when the expo opened at 2pm on Friday afternoon. I was scheduled to volunteer at the Kona Running Company booth from 2-8pm so I went when it opened to get my packet first. I could not believe the number of people that went right when the expo opened. I got there about 1:30pm and had to wait to get in. The expo was also open all day on Saturday as well. Once in, I went right to the packet pickup area. As is the case with most marathon expos, they make you go through the expo so that you see all the vendors. I actually love going through the expo and looking for deals. I didn't spend much time looking but I'm sure I could have bought something at least where the marathon merchandise was located near the front of the expo. Fortunately, I walked out of the expo at the end of the evening without buying one single thing! Like I need more running stuff. The packet pickup was very easy even with all the people already there. You made your way to where your event and number was and gave the volunteer your number. Since this is an international event, you had to have your passport or they would not release the bib to you. This meant nobody could pick up your packet for you but you. They gave you a clear bag for gear check and some information and trinkets in the packet along with the shirt. Each event for the marathon, half marathon, relay team and 5k had their own area so it was not conjested at all. The race also offered a US only half. The volunteers were very friendly and knew what to do. If you forgot your bib number, you could look them up on a computer there. In addition, if there were any issues, they had a problem solving table to get it resolved right then. You also had an opportunity to sign up with a pace group if you chose to do that. This was also the area to go to if you needed to check in to volunteer for the race. The packet pickup area was well spaced out so it didn't seem crowded. Check out how many people are already there and it literally just opened minutes ago. After I picked up my packet, I took some pictures of the entire expo and looked around a little bit. The expo had over 90 vendors so there was plenty to see, buy or learn about. They had a ton of race merchandise and you could go crazy there. If I were running the full, I may have bought something but I've been to so many half marathons, I didn't see the need. The vendors were local running stores, other races, and people selling their products. In addition, the race had seminars throughout the day that helped runners on various topics. I didn't have time to stay for any since I was volunteering and I didn't feel like coming back on Saturday but it was a nice touch to offer this. It would be nice to meet a famous runner but nobody was scheduled that I heard of. 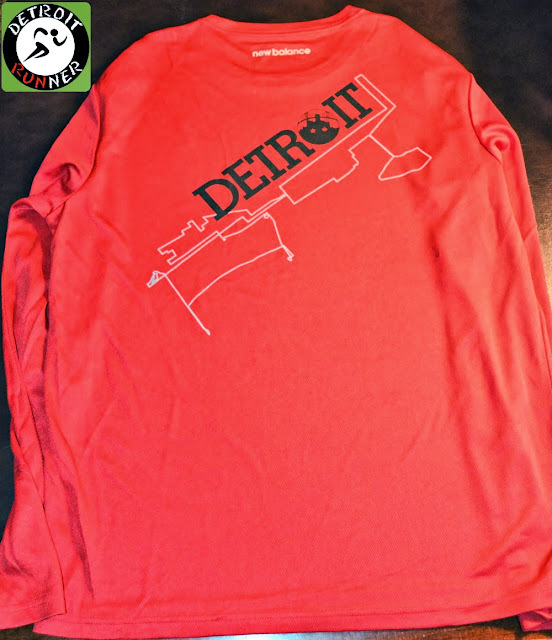 My friends over at RUNdetroit were there with a booth set up and they had a video of the course preview which was cool to see. You can see it online HERE if you are considering running the race in the future. The race also had their typical billboard on a truck of the race course map which everyone always takes pictures at. You can see below the huge amount of merchandise that the race offered in the picture. The clothing was made by NewBalance and was very high quality(read expensive) so I passed. I will say I regret not getting a jacket when I ran the full in 2011 here so if I ever run the full again, I'm sure I'll get something. People were buying stuff like it was free. Haha! After I toured the expo, I met up with Alan from Kona Running Company to help talk to runners about the Kona races. Since I've run so many of the Kona races, it was pretty easy and fun to talk with runners about the races. They have five races now including the Wicked Halloween and Kona Chocolate run that is coming up this month and next. I will say the woman were going crazy over the Chocolate run. I'll have full reviews on both races after. 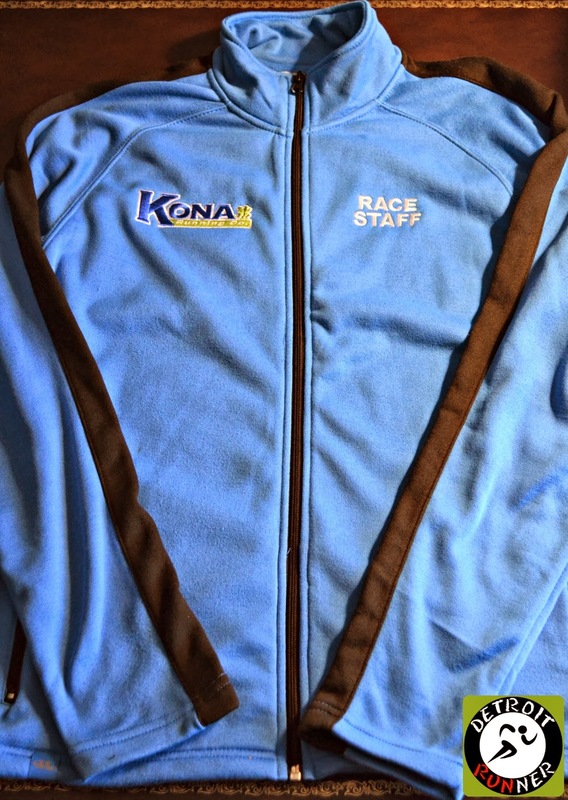 Alan even made me an honorary Kona Race Staff member and gave me a shirt to wear. Sweet! I had lots of people come up to say hello who follow the blog and met a few new people as well. I even got an opportunity to take a picture with Diana who follows along on Twitter. While working the booth, I could not believe how busy it was. It literally did not stop from the time I started at 2pm until the close of the expo at 8pm. Kona's booth was certainly one of the more popular booths as many of the runners wanted to see the shirts as well as previews of the race medals for the next two races and to see the triple crown medal. If you did not see the medals, you are in for a real treat! Kona knows their bling! On Saturday evening it was early to bed since I had to be up at 3:45am to get downtown. The roads this year were closing at 6am so we planned to meet up with a local runner, Rich, who I've run with before at a Kona race. Rich's office was downtown and he graciously offered to allow us to park and wait at his office which was only a few blocks from the start. 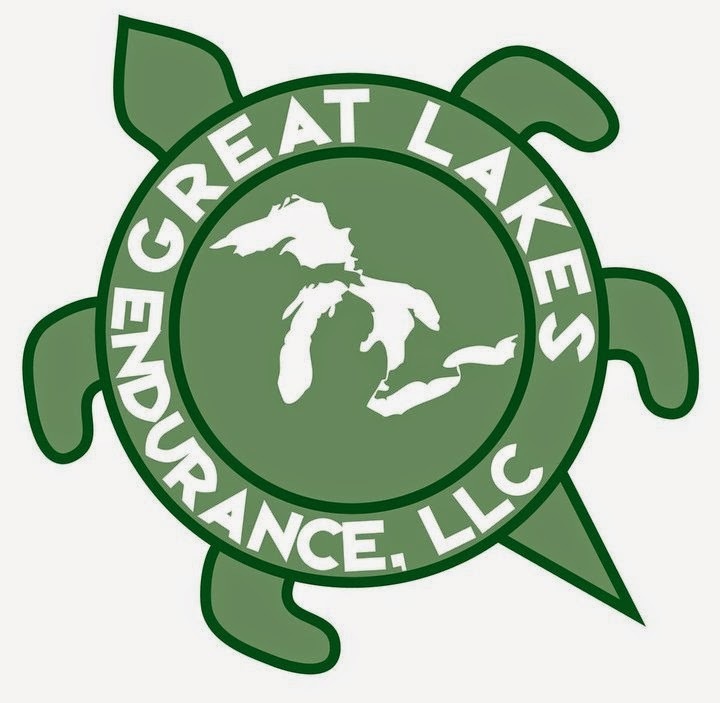 While it made for an early morning, it was nice to relax in the warm office and use regular, private bathrooms before we headed to the start area. About 25 minutes before the start, we walked down to get in our corral. It was crazy crowded! When I signed up in January, I didn't have anything else on the schedule so I figured I would run this hard and was placed in corral B, the first non-elite corral. Since I changed this to a training run, I moved back into corral D with my running buddy, Trieu, so I would be in the correct corral. He was running the full this year for the first time. With the corrals going out, we had about a six minute wait which was not bad at all and, while the start was still crowded, it was manageable with the corrals and a much welcomed improvement to the race. As we made our way closer to the start line, there was a video screen showing the next wave to go out. Of course, since the start was at 7am, it was still dark as we went off. The corrals went all the way to letter O so I'm sure it took some time to get everyone on the course. The race had cutoff times throughout the course but they were pretty liberal with the times and you could have easily walked the entire course, as many walkers do. All the runners behind us! It was a bit chilly to start and a little windy on the bridge, but otherwise, it was an incredible day for a race. Of course, one of the best things about this course is going over the bridge into Canada and then coming back into the USA through the tunnel. If you were running the half or the full, you pretty much ran the same course until about 12.5 miles when the course split. While most of the course is really a nice run, I've run both the full and half and the first half really is the best part of the race. As I said, this was planned as a training run for me so I planned to take things easy. Of course, I went out way too fast for the first mile and then scaled back the pace. Note that when I went through the tunnel, my Garmin shut off and while it picked back up after I got out of the tunnel and the time was accurate, the mileage was off for the rest of the race. I didn't actually run a 17 minute mile. Ha! In addition, the course was not short as it appears on my distance. As we started it was still dark. You can see we start off on the streets of Detroit downtown heading towards the Ambassador bridge over to Canada. The bridge looked incredible all lit up in the dark and the moon was glowing as well. My pictures don't do it justice. The bridge is the funnest part of the course and this and the tunnel are really the only main hills on the course. There are some bunny hills throughout but nothing much after the tunnel. The view of the Detroit skyline from Canada is also a great part of the race and it's also when things start to get lighter out so the view is fantastic. Mile 7-8 is the "underwater" mile through the tunnel back to the USA. While it's a unique experience to do this, it's not something I think is that fantastic. I think you either love the tunnel or hate it but it's the only way back to the USA so it has to be done. Last time I tried to get a picture of the flags in the tunnel while running and it didn't come out so this time I jumped to the side to stop and get a better picture. Not many chances to do that except for this race. The course changed this year after you come out of the tunnel and we now go under Cobo via the freeway instead of making a turn and running next to Cobo. 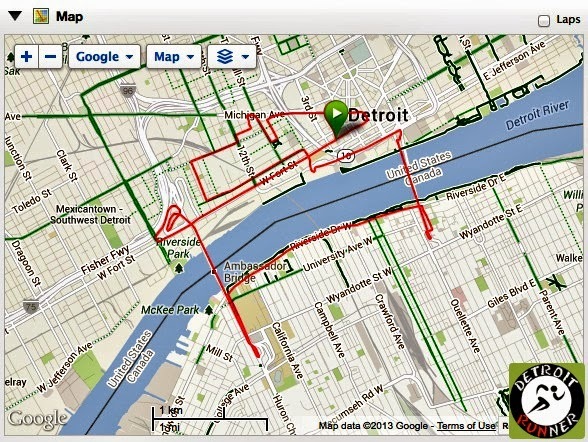 I did like that we got to run past Joe Louis Arena where the Red Wings play so that was fun. 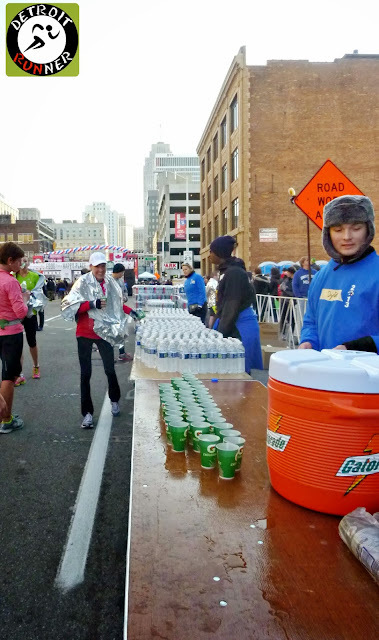 After this we run through Mexicantown and into Corktown where the Turkey Trot is run. I love running on the old cobblestone streets from a 100 years ago. From there we head back to downtown until we split from the marathon towards our finish. It really is a well planned course for both the half and the full. Almost to the bridge - check out the moon! This was the new portion of the changed course which seemed to work out great if you were a spectator. All the aid stations were manned with water and Gatorade and the volunteers were awesome and were cheering on the runners. There were many more aid stations than I took pictures but you get the idea of them from these pictures. While I don't need it for a half marathon, I was surprised we didn't see any GU on the half course. It seems there are many runners that could use it on the half marathon. The finish line is where the start was and was very organized. The race had metal fencing about the last four blocks or so to keep people off the course. There were tons of people at the finish cheering on runners. They even had bleachers this year at the finish line. After you finished, a volunteer gave you a medal, then came a volunteer with water and you continued further until there was food. They had volunteers keeping everyone moving through the line. They offered water, Gadorade, bananas, chips, salsa, hummus and chocolate milk. A nice offering of finish line food. 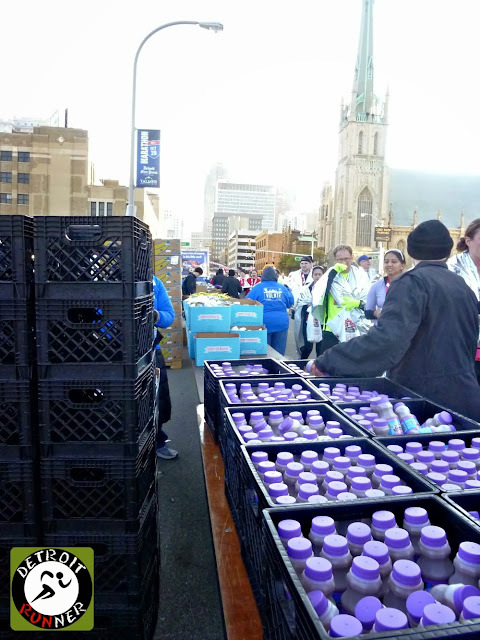 Once you got your food, you exited the finish line area and next to it was gear check so you could pick up your packet if you checked it. There was a relay reunion area which Trieu and I used to meet each other after the race. 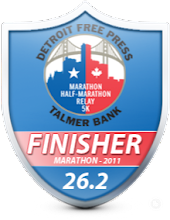 Next to this was Conquered - Detroit after marathon party. They had a DJ in there with beer and other food for sale as well as more marathon merchandise in the New Balance tent. There was a direction sign which was nice to help you get back to where you park or came from. There was actually a lot of runners socializing in this area as well as resting on the grass. The area also had free massages for the runners but the line is always so long that I never wait for one and never have for any race actually. For your race registration, you received a certified and chip timed race which was mostly closed to traffic and police controlled. 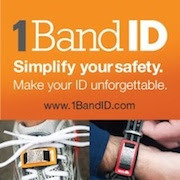 You could track a runner live on your phone or computer. After the race you could also scan the QR code on the race bib to check your results immediately. You received access to the expo but it was also open to the public. 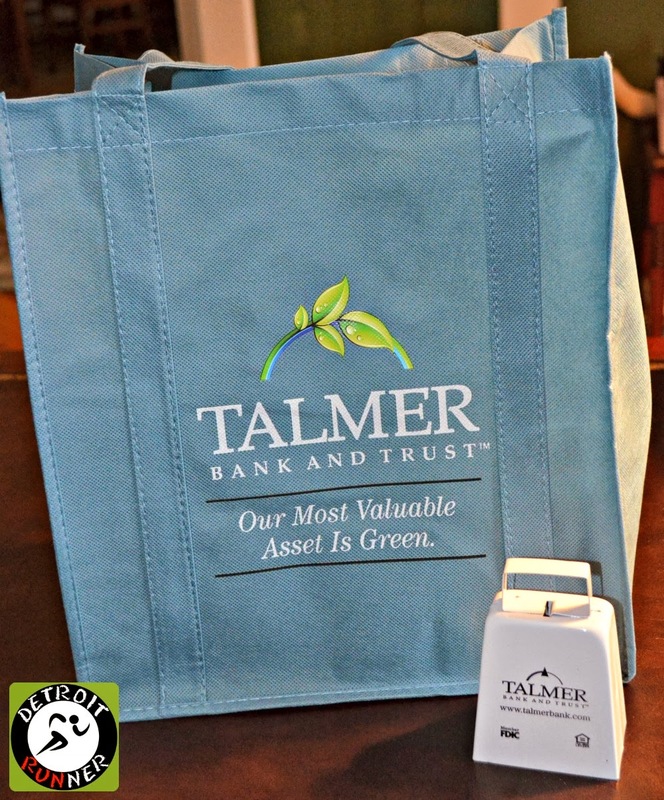 Everyone received a fabric bag and a cowbell from the main sponsor at the expo. 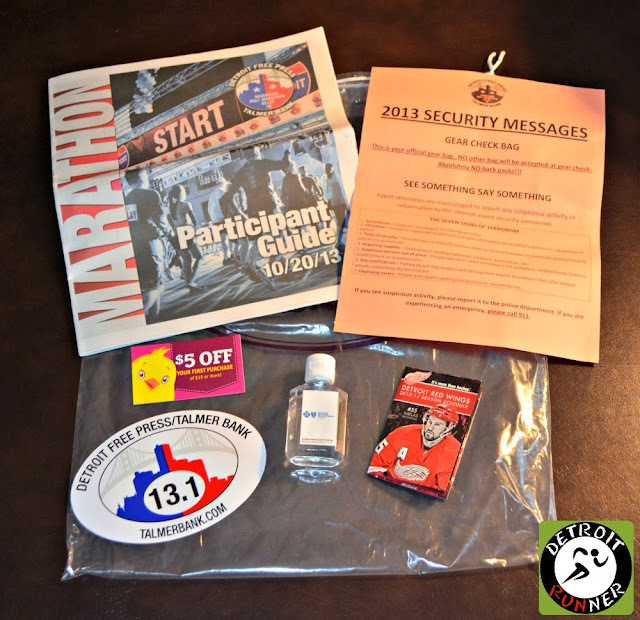 The race packet had several things in it but most of it will be thrown out. I think it makes sense for the race to go to a virtual race bag as it not only saves the volunteers time but helps with the environment. You received a nice long sleeve New Balance tech shirt and one of the best finishers medals I've received for a half marathon. The design is great and was voted one of the top 10 medals in a previous year. Everyone also received a car sticker based on the race you did. Finishers also received an electronic finishers badge as well as a Facebook banner for your Facebook cover if you have a Facebook account. The shirt has a really nice design this year. Actually when I did the full and relay, they were also nice designs. The medal is one of my favorite finishers medals. It also has a great ribbon that goes along with the international theme. I took the picture below of the little bag with safety pins in them. This is a great example of the level of organization this race staff shows. Can you imagine the amount of time it takes to do this? It's all about attention to detail and with 25,000+ runners overall for all races, it's a must(and welcomed) to be organized to this level of detail. The communication with its website and Facebook page is superb. I've always felt like the race staff does everything it can to address every single detail of the race to make it enjoyable for the runners. All runners questions on their Facebook page(HERE) received prompt attention. Overall, this is certainly a race I would do again. First, I love that it's my hometown marathon but it's so much more than that. This is a premier sporting event and Detroit knows how to do sports. From the excellent expo to the unique course. From the awesome finish line to a great after party, this staff just knows how to put together an awesome running event. 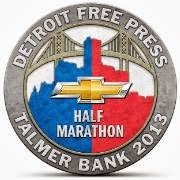 It's certainly a key race if you are a runner looking to run a marathon in Michigan. My running buddy Trieu and I at the finish - he did the full and got a larger medal. Note: I was not paid or compensated for this post. I LOVE your recaps, Jeff. This is so awesome for anyone who is considering the race or wants to know more about it! You captured so many of the moments perfectly! Thanks for the comments. I just try to capture what I see and hopefully it helps people decide if they want to run it. I agree. Your race recaps are great and appreciated. Glad the day went well. Great race report as always Jeff. I always try to get to the Expo as early as possible so I don't have to mess with it the rest of my trip - Michael likes to go early to get the best selection of stuff - ha. I agree, I love the medal too. The lanyard/ribbon is AWESOME!!! And the picture of the bridge with the moon is amazing - one of my favorites you've taken. Great job always! If I were running the marathon, maybe. Nice race Jeff. It was good to see ya at the expo & after the race. I agree with the first half of the marathon being the best part of the course. Overall, I was very happy with the event and would consider running it again. I was wondering about the medals. During the day Sunday I saw several pictures of medals posted on Facebook, some full and some half and they all looked the same. Now I know! I'm glad you had a good race! Maybe I will see you at the Wicked run! So are most of the runners from the US or from over the boarder? It's also nice to see you running halfs with no trouble, the sign of a marathon runner!!!! There's both Coach. Mostly US but many from Canada as well. Great run and report, well done! That's a good run as a training run. I would love running the bridge and the tunnel! Awesome event and bling! Thanks for the nice photos!